Urdaisunia, once the greatest civilization in the world, now lies in ruins. Rashali, a widowed Urdai peasant woman, has vowed to destroy the conquering Sazars, even if it costs her her life and everything she has. Prince Eruzasharbat, heir to the Sazar throne, walks a dangerous line between loyalty to his own people and doing what he believes is best for all the people of Urdaisunia. The gods, who once favored Urdaisunia above all other lands, cannot agree on who should be allowed to rule the land – the Sazars or the Urdai. While they argue, Urdaisunia and its people are dying. Then a chance encounter between Rashali and Prince Eruz draws the gods’ attention to Rashali, and a bet between two of the gods sends peasant and prince on intertwining paths of danger, intrigue, love, and war – paths that will change their destinies, the destiny of Urdaisunia, and even the fate of the gods, forever. When I read the blurb about this book, I was intrigued and interested, although I usually shy away from novels of this nature, immortals and mortals, mainly because the few I have read usually lack depth and fail to deliver a convincing believable storyline. However, this one proved an exception. The story is set around Rashali, a peasant Urdai widow, who, despite her reluctance to act, shows she is a strong and confident individual, whose presence and bearing has a great impact on all those who cross her path. Some of the strange names took some getting used to, but this was not an issue for me. The characters were solid and believable, and the situations they found themselves in was well delivered. As I read, I could easily have believed this was set in a middle-eastern country thousands of years ago, and the writing was sufficiently descriptive enabling me to picture the world the story was set reasonably well, which is essential in Epic Fantasy novels. The story moved along at a good pace and kept my interest from start to finish, and there was a good balance of romance, feuding, and fighting. The interference of the gods in the mortal world was minimal but effective, and it was refreshing to see dissention amongst the gods, and the adverse effect on them because of it. 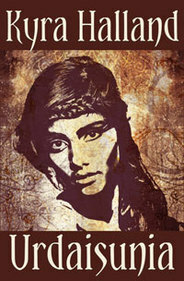 Overall, Urdaisunia was a well written novel, which I enjoyed, and would recommend to anyone who enjoys adult Fantasy.